Hughes started the Billy Hughes’ training camp at Goulburn to train men for overseas service in preparation for a successful result in the referendum. Nothing was more divisive than conscription during the First World War. Argument over conscription split the Labor Party in 1916 when Hughes said ‘Let those who think with me, follow me’. Conscription is compulsory enlistment in the armed forces. This means that if you are conscripted you have no choice but to join the armed forces. 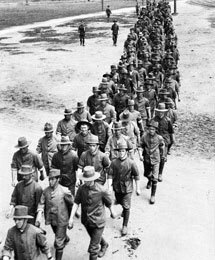 In 1916, Australia had compulsory military service but conscripted men could only serve within Australian territory. Billy Hughes wanted to extend conscription so that men could be sent to reinforce the front line in Europe. In the first few months of war many Australians enlisted to fight. The number of men who volunteered was greater than needed and at first some were turned away. News of casualties on the front began to reach home and support for the war declined sharply. It became more difficult to persuade men to sign up. Recruitment campaigns became more intense. 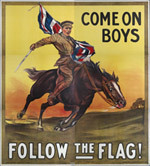 Posters and speeches targeted men ‘eligible’ to enlist. Many eligible men over the age of 21 who hadn’t enlisted were labelled ‘shirkers’ and ‘traitors’. After heavy casualties on the Western Front, Britain pressured Australia to make a bigger contribution to the war effort. In 1916 Prime Minister Hughes visited Britain and the war front. He returned to Australia convinced that conscription must be introduced to win the war. The Federal Parliament has the power to introduce conscription with a majority vote in the House of Representatives and the Senate. However the Labor Party, led by Billy Hughes, had a policy against conscription and a majority of Senators were also against the introduction of conscription. To get support for conscription Billy Hughes decided to ask the peoples’ opinion in a national referendum. In a referendum people are asked to vote directly on an issue. In Australia today the word referendum refers specifically to a vote to change the Australian Constitution. The 1916 and 1917 votes were technically plebiscites or opinion polls. Australia has had three national plebiscites; the two conscription plebiscites and a 1977 plebiscite to choose the Australian National Anthem.